Even the best of men require leadership. A leader is a person who creates an inspirational image of the future and helps in attaining that inspiring vision. Leadership is the art wherein leaders motivate others to set a goal and then coach and guide them in attaining that goal. They lay a vision for life and act as a torch bearer who shows the path to realizing that vision. When we use the word leader, several images come to us. Sometimes we refer to a leader as a political leader, who is passionate about a personal cause. Sometimes we consider him as a pathfinder laying a route for others in his tribe and practically showing the right path. And sometimes as a company’s employee developing strategies to beat the competition. Leadership, as stated above, is the art of showing people a path to walk on. It is similar to giving direction. Most of us know what we want to do but are not clear about the path that we should take to achieve that goal. Sometimes we are not even clear about our goals. We don’t know where we want to go. In this case, the role of a leader comes as an inspirational role. A leader lets us realize our hidden aspirations sometimes by merely knowing about his work and life. 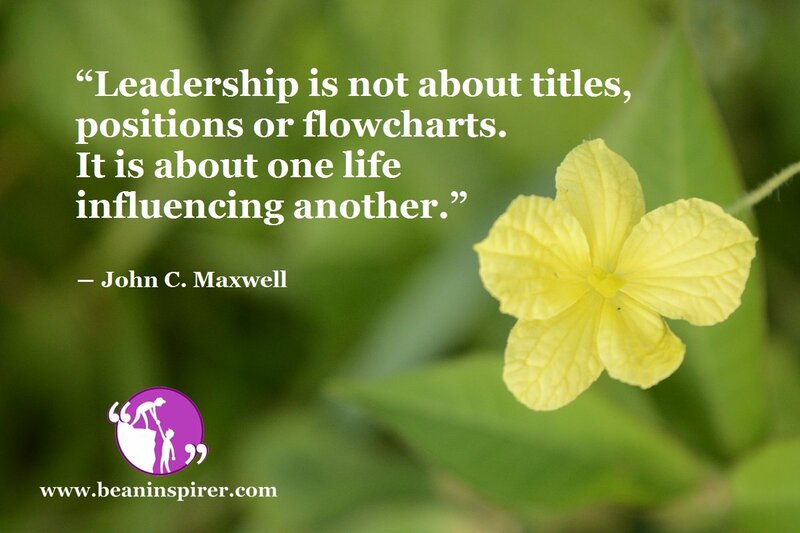 John C. Maxwell quoted, “Leadership is not about titles, positions or flowcharts. It is about one life influencing another”. This is just so true. However, in the present time, we have misinterpreted the term Leadership. Today people want to be leaders in a way to make others follow them. The motive has changed from inspiring others to gaining power and leading people. In the present world, Leadership has become more about positions. People want to have the highest position to be a leader. It’s more about hierarchy and people want to be a leader in order to be at the top of that pyramid. This has completely changed the meaning of a leader. Leadership, in actual terms, means inspiring people and propelling them to achieve their goals and visions and it does not mean being the boss and being at the top of the ladder for power and money incentives. A good leader is one who influences others to walk on the correct path and attain their goals and visions. There can be endless traits of a good leader. Some of the most required attributes are focus, confidence, transparency, integrity, inspiration, passion, innovation, patience, honesty and commitment. One cannot aspire to be a true leader. Leadership is not an aspiration rather it is a way you influence people by these qualities. Today most of the people want to be a leader. Nobody can want to be a leader. A true leader is a leader is one who people see as a leader through his way of thinking, philosophy, lifestyle, life goals, and vision. Such people do not want people to follow them. Such people want others to be influenced and get a change in the way they think and thus helping then grow. They are the people who influence the ideology of people and thus transforming their lives for better. Thus leadership is the art of influencing people to grow towards building a better world. History and present time have shown us some great leaders. They were and are the leaders that cast positive impact on the lives of other people. People see and observe their life and get inspired, motivated and influenced. This is how a leader should be and they should not be worried about how many people are following them. Some people that have been leaders in the true sense are Nelson Mandela, Mohandas Karamchand Gandhi, Martin Luther King, Jr., Mother Teresa and much more. These were the people who gave their lives in a way that inspires and influences people to walk on the path shown by them. The one thing that is common in these people is that they were selfless and did not do what they did to get power, fame, and praise. This is what is being a true leader means. It was their actions, their preaching, their ideology, their way of leading life and their commitment that influenced people to follow them. Thus a true leader does not think about positions and power. He thinks of influencing people to transform their lives for growth and betterment.